I have loved Sound of Music for very long now, and have fond memories of kneeling outside class, thrown out for attempting a yodel in the middle of History period. (You can’t not want to yodel after you learn the “Lonely Goatherd” in Singing period just before that). The night I saw the film, I prayed desperately that The Von Trapp family had reached safely across the mountains to Switzerland. The Mumbai musical theatre scene is not huge. In the past, Man from LaMancha, Evita, Jesus Christ Superstar have found space on our stages to much acclaim but the names and players of the game have essentially been the same. This version of the Rogers and Hammerstein classic, produced by Raell Padamsee’s ACE Productions is playing at St. Andrew’s College Auditorium on weekends. Dilip Tahil as Captian Von Trapp is superb. He looks absolutely dashing in his long-tailed coat when he teaches Delna Modi’s Maria how to dance. And who knew that Shahrukh Khan’s father-in-law from Baazigar could sing? His rendition of “Edelwiess” is genuinely touching. Delna Modi’s Maria is the centrepiece of this show. She is no doubt one of the finest vocalists in Mumbai theatre today and this show only clinched that belief. Her Maria, however, is one-dimensional played too childishly, making Tahil’s Captain Von Trapp oddly unsuited for her. Lucky Morani’s Elsa was every bit the saccharine manipulator as expected of her, though she did get vocally lost in a cast of very strong and talented singers. 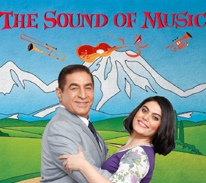 But ACE Production’s Sound of Music falls into the same trap that Hindi movies fall as far as songs are concerned. Songs, in Hindi movies, for a very long time, have served as a pause in the action of the film, when the guy behind you stops talking on his phone to ask his friend what the story so far is and everyone on-screen suddenly seems to be able to follow every step the guys on his left is doing without needing further provocation or direction . (It was in later films like Dil Chahta hai that music receded into the background and allowed the narrative to continue over it.) In musicals however, the song IS the narrative. It is when new revelations are made, themes are established, characters and relationships are deepened. But ACE Productions’s Sound of Music suffers from the malaise of lulls in the story-telling because choreographing everything to tee, but not saying anything did not hold my attention for too long. Director Advait Hazare could have used the classic numbers of Sound of Music to further acquaint us with the 7 Von Trapp children in the 2.5-hour run time of the show. They remained a general mass of cuteness with little room to be individual characters. Even the escape of the Von Trapp family from Austria was a messy affair on stage with no one heading in any direction in particular for about 5 minutes. ACE’s Sound of Music, is a production that you definitely don’t want to miss. In spite of it’s drawbacks, it is rare to find the mix of powerhouse performers that one does on this stage and an honest-to-goodness production that will leave you with a smile on your face. And of course to watch the kids of Seva Sadan and Happy Home and School for the blind was touching. There wasn’t a dry eye in the house. It is this cohabitation of art and social cause that attracted me to the Mumbai Theater in the first place and it is a relationship that I hope lives on in the theatre tradition of Mumbai for a long time to come.